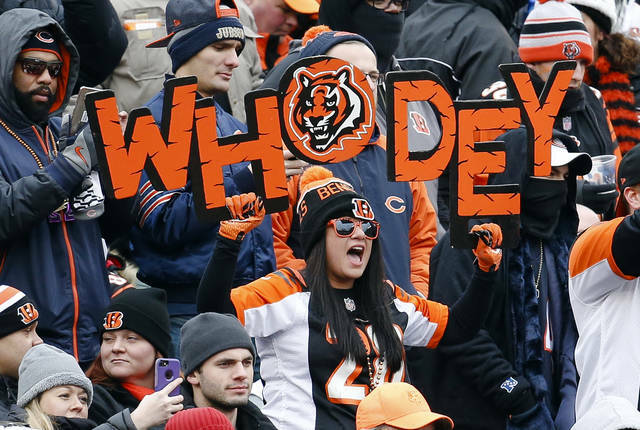 The Who Dat folks from New Orleans go head-on with the Who Dey fans in Cincinnati on Sunday. And don’t ask which group first came up with its catchy phrase and odd rendering of the English language. Granted, those are three of the NFL’s top attacks. 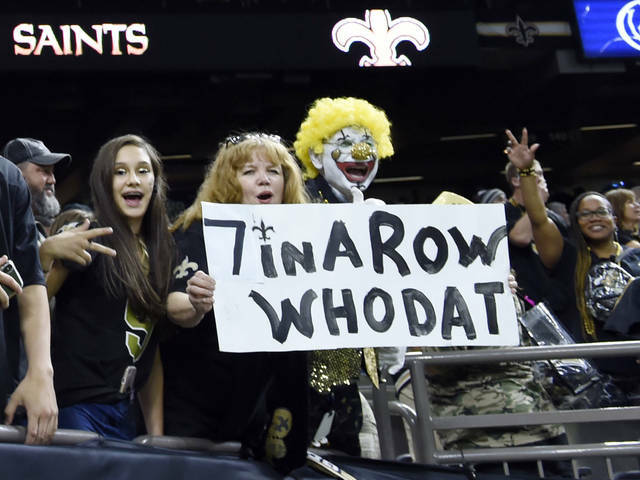 The Saints are up there, too, so if Cincinnati gives up 500 yards Sunday, it will become the first team to allow 500 in three consecutive games. The weekend began Thursday night with Pittsburgh’s 52-21 home victory over Carolina. Ben Roethlisberger threw for 328 yards and five touchdowns to help the Steelers (6-2-1) win their fifth straight. The Panthers (6-3) had won three in a row. For the Cowboys to stay real in the NFC East, they need a quick reversal of fortune. With four of those five losses coming on the road, a visit to the Linc isn’t all that enticing. These teams meet on “Sunday Night Football” for the 10th consecutive season and 12th time overall. Dallas must find a passing game somewhere, and spring Ezekiel Elliott for some big plays, but the blocking unit has declined significantly. Both teams boast potent ground games, with the big star being LA’s Todd Gurley. The Rams are No. 1 in the NFL with Gurley at 868 yards rushing; he also has 12 TD runs; he has scored in 12 consecutive games, the longest regular-season streak in team history. The Cardinals are 0-4-1 at Kansas City, and this isn’t exactly the best time to be visiting. Arizona has the NFL’s worst offense and ranks 31st in pass defense. All the Chiefs do, with Patrick Mahomes, Kareem Hunt, Travis Kelce and Tyreek Hill, is score, score and score some more. A very lopsided series recently in favor of Detroit, which has won nine of 10. Indeed, Chicago hasn’t won an NFC North game in its past 10 attempts. The Bears also are decently balanced and rank fifth in scoring. Still, their calling card is on D, and they scored twice that way against Buffalo: Eddie Jackson’s 65-yard fumble recovery and Leonard Floyd’s 19-yard interception return. Tampa sure can pass and sure can score, but it often falls so far behind that it can’t catch up. The Bucs have been outscored 103-27 in the first half of Ryan Fitzpatrick’s past three starts, all losses. Injuries seemed to ruin the Falcons’ season, yet here they are at .500 and with six games upcoming against teams currently owning losing records. Matt Ryan is having an outstanding year, even while overshadowed in the NFC South by Brees and Cam Newton. The Browns have dropped four straight, and are 0-1 under interim coach Gregg Williams. But their .786 winning percentage (11-3) against the Falcons is the team’s highest against any opponent. Another guy not getting enough recognition for a superb passing season is Philip Rivers while Patrick Mahomes grabs the AFC West headlines. Playing the woeful Raiders shouldn’t hurt Rivers’ resume: He has completed 75 of 100 passes for 994 yards, six TDs and no INTs in his past three outings vs. Oakland for a 126.0 rating. Plus, the Chargers have won five straight for their best record at the season’s midpoint since 2006. Aaron Rodgers, of course, doesn’t throw picks. Rodgers has thrown 15 touchdowns to one interception, leading the league with a 0.3 percent interception percentage. And RB Aaron Jones leads the NFL at 6.03 yards per carry. There’s plenty of skill at quarterback, however. Andrew Luck, who missed 2017 with a shoulder injury, is back in fine form and has not been sacked in his past 154 pass attempts dating to the second offensive play against New England on Oct. 4. It’s the longest stretch of his pro career. Colts K Adam Vinatieri will be honored for breaking the NFL’s career scoring record two weeks ago at Oakland. Vinatieri needs one win to tie George Blanda (209) for most regular-season wins in league history. Sam Darnold has regressed behind center for the Jets and now has a foot injury. But let’s be fair: Darnold has very little help, especially with versatile RB Bilal Powell on IR. Last year’s starter, veteran QB Josh McCown, steps in. As for Buffalo, well, maybe getting rid of Tyrod Taylor wasn’t such a wise move. This isn’t likely to be as much of a sleep-inducer as Bills-Jets. At least a national TV audience gets to watch Saquon Barkley, the most dynamic rookie to hit New York since Odell Beckham Jr. — and without all the baggage.